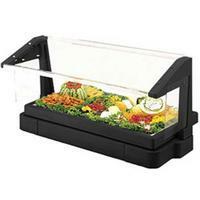 The Buffet Bar with Sneeze Guard is perfect for single-side, self serve buffets. Easily turns any table into a profit producing food buffet bar. All models accommodate GN 1/1 Full or Fractional Size Food Pans, 2-1/2" or 4" deep, with DIV12 and DIV20 Divider Bars. Double-wall polyethylene construction provides extra strength, durability and reliability. Scratch-resistant textured exterior. Simple to clean - just wipe off. Thick polyurethane, foam-insulated ice well holds ice for hours to keep food presentation fresh. Drain plug is included to offer quick and easy clean up. Standard accessories include protective sneeze guard, made from NSF listed material. to offer even greater merchandising opportunities. Optional accessories include Divider Bars, Crock Holder, and Salad Bowl Holders.